The new canoe is off of the mold, and it is time to start closing it up. First step is to install the decks and fit the stem. I work in the tradition of Peterborough and Chestnut. One of the details that this sets up is the mortise and tenon stem-gunnel joint. There are many ways that builders have addressed this joint. The tradition that I work within has the tip of the stem trimmed down from the wedge shape to a rectangular tenon which fits into a mortise that is formed where the gunnel tips meet. 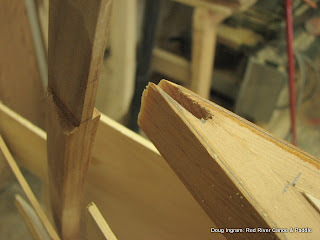 The mortise is cut into the gunnels while the parts are secured to the mold. This ensures that when it comes off of the mold everything lines up as it should. Its always a thrill when a new canoe comes off of the mold! 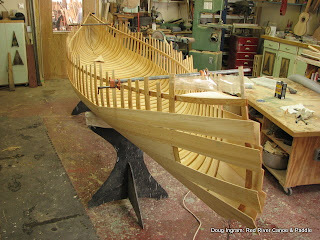 The pipe clamps hold the gunnels from spreading the canoe out & the packing tape holds the stem in place until the planking ends are secured. It looks pretty floppy at this stage, and it is, until all the parts are secured. Posted by Doug Ingram at 7:42 p.m.